HiveExternalCatalog is a external catalog of permanent relational entities (aka metastore) that is used when SparkSession was created with Hive support enabled. 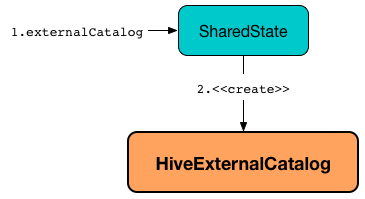 HiveExternalCatalog is created exclusively when SharedState is requested for the ExternalCatalog for the first time (and spark.sql.catalogImplementation internal configuration property is hive). The Hadoop configuration to create a HiveExternalCatalog is the default Hadoop configuration from Spark Core’s SparkContext.hadoopConfiguration with the Spark properties with spark.hadoop prefix. HiveExternalCatalog uses the internal HiveClient to retrieve metadata from a Hive metastore. spark.sql.catalogImplementation configuration property is in-memory by default. Use Builder.enableHiveSupport to enable Hive support (that sets spark.sql.catalogImplementation internal configuration property to hive when the Hive classes are available). Use spark.sql.warehouse.dir Spark property to change the location of Hive’s hive.metastore.warehouse.dir property, i.e. the location of the Hive local/embedded metastore database (using Derby). doAlterTableStats is part of ExternalCatalog Contract to alter the statistics of a table. statsToProperties converts the table statistics to properties (i.e. key-value pairs that will be persisted as properties in the table metadata to a Hive metastore using the Hive client). statsToProperties takes the column statistics and for every column (field) in schema converts the column statistics to properties and adds the properties (as column statistic property) to the properties. statsFromProperties collects statistics-related properties, i.e. the properties with their keys with spark.sql.statistics prefix. statsFromProperties returns None if there are no keys with the spark.sql.statistics prefix in properties. If there are keys with spark.sql.statistics prefix, statsFromProperties creates a ColumnStat that is the column statistics for every column in schema. For every column name in schema statsFromProperties collects all the keys that start with spark.sql.statistics.colStats. [name] prefix (after having checked that the key spark.sql.statistics.colStats. [name].version exists that is a marker that the column statistics exist in the statistics properties) and converts them to a ColumnStat (for the column name). statsFromProperties is used when HiveExternalCatalog is requested for restoring table and partition metadata. listPartitionsByFilter is part of ExternalCatalog Contract to…​FIXME. alterPartitions is part of ExternalCatalog Contract to…​FIXME. getTable is part of ExternalCatalog Contract to…​FIXME. doAlterTable is part of ExternalCatalog Contract to alter a table. getPartition is part of ExternalCatalog Contract to…​FIXME. getPartitionOption is part of ExternalCatalog Contract to…​FIXME. columnStatKeyPropName builds a property name of the form spark.sql.statistics.colStats.[columnName]. [statKey] for the input columnName and statKey. columnStatKeyPropName is used when HiveExternalCatalog is requested to statsToProperties and statsFromProperties. getBucketSpecFromTableProperties is used when HiveExternalCatalog is requested to restoreHiveSerdeTable or restoreDataSourceTable. restoreHiveSerdeTable is used exclusively when HiveExternalCatalog is requested to restoreTableMetadata (when there is no provider specified in table properties, which means this is a Hive serde table). restoreDataSourceTable is used exclusively when HiveExternalCatalog is requested to restoreTableMetadata (for regular data source table with provider specified in table properties). listPartitions is part of the ExternalCatalog Contract to list partitions of a table. doCreateTable is part of the ExternalCatalog Contract to…​FIXME. tableMetaToTableProps is used when HiveExternalCatalog is requested to doAlterTableDataSchema and doCreateTable (and createDataSourceTable). doAlterTableDataSchema is part of the ExternalCatalog Contract to…​FIXME. createDataSourceTable is used exclusively when HiveExternalCatalog is requested to doCreateTable (for non-hive providers).